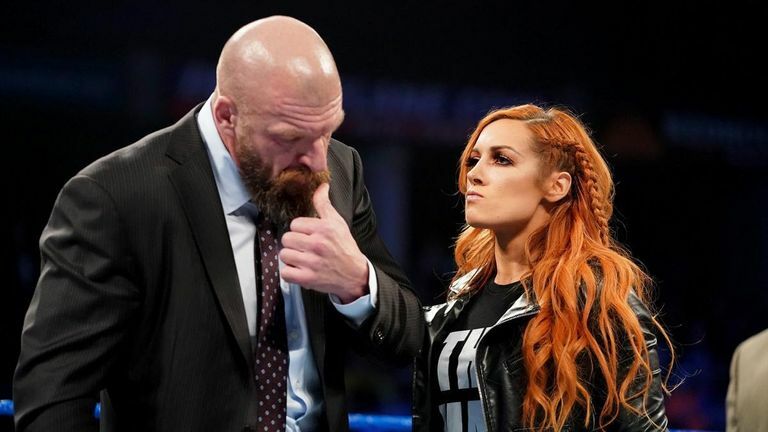 For the second night in a row, Becky Lynch assaulted a member of the WWE's corporate structure by slapping Triple H.
Just 24 hours after putting a beating on the company's chief brand officer Stephanie McMahon, Lynch was again on the attack with a vicious slap to her husband, Triple H.
The Game had arrived on SmackDown to intercept a stand-off between Charlotte Flair - who taunted the Lass Kicker by emphasising her match fitness - and Lynch, who is technically suspended by WWE. Triple H's theory was a sound one: that Lynch is refusing to seek medical advice on her knee injury not because she is worried she won't be cleared to fight Ronda Rousey at WrestleMania but because she will be cleared. Lynch herself does not buy into that fear of failure, at least not publicly, and emphasised that point with a slap across the face, for which there will surely be severe repercussions. The full details of the Elimination Chamber six-way battle to establish the new WWE women's tag-team champions are now known, with two SmackDown teams taking the final two spots. 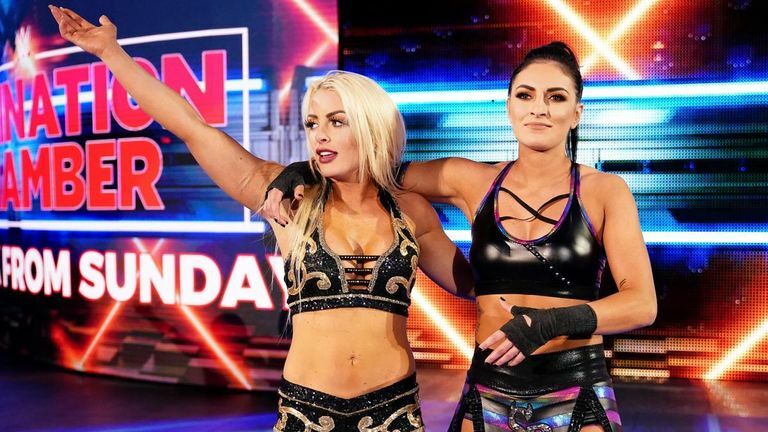 Carmella and Naomi, who were on the wrong end of a loss to Mandy Rose and Sonya Deville last night, were added to the match alongside their conquerors and another team who were in the match, the IIconic duo of Peyton Royce and Billie Kay. The Raw half of the bracket is made up of Nia Jax and Tamina, Liv Morgan and Sarah Logan, and Sasha Banks and Bayley, with the latter duo being the strong favourites to take the belts. The six-way bid for the WWE championship is now at full intensity after every man attempted to gain an Elimination Chamber advantage on SmackDown. Jeff Hardy had the win in the bag against champion Daniel Bryan only for Erick Rowan to interfere and cost him a non-title win, before Samoa Joe came out to attack the title-holder. That led to run-ins from Randy Orton, Mustafa Ali and AJ Styles as the crowd were treated to an all-out brawl and given a glimpse of what to expect at the Elimination Chamber on Sunday, February 17.